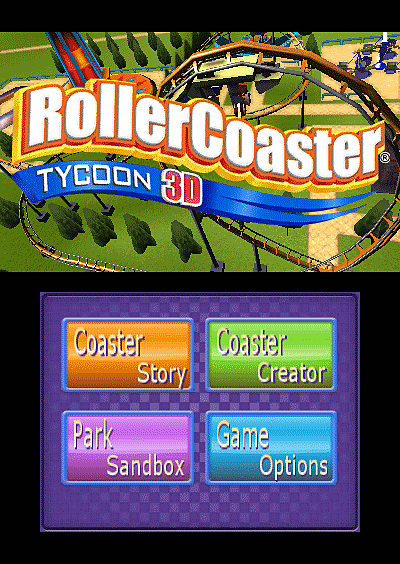 Immerse yourself in the pinnacle of all theme park simulators with RollerCoaster Tycoon 3D, tailored exclusively for Nintendo 3DS™. From constructing the wildest roller coasters to picking out the perfect spot for your stores and amenities amidst jam-packed crowds, you can finally enjoy the classic RollerCoaster Tycoon experience on a portable handheld for the first time ever! Complete creative freedom with streamline controls: a deep coaster construction system and robust theme park customization. Design the wildest, most imaginative roller coasters using a user-friendly toolset and a wide array of upgrade possibilities and park themes at your disposal! 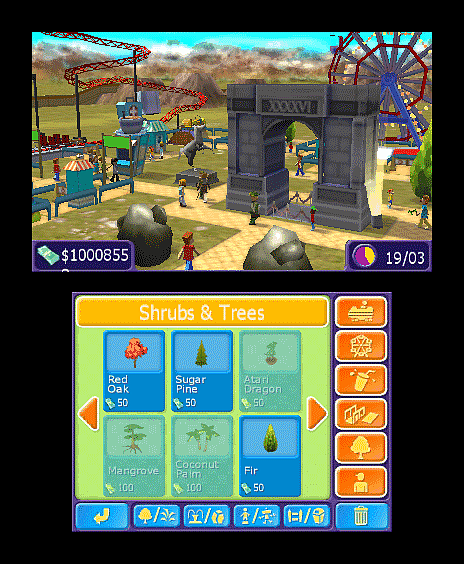 A deep and immersive management sim experience: RCT 3DS takes the demanding management simulation from the PC series and compresses it into a handheld form, creating a challenging yet manageable take on the sim genre for players of all ages. New gameplay mode with special unlockable content: choose your own player character and then set off on a journey around the world to expand your roller coaster empire. 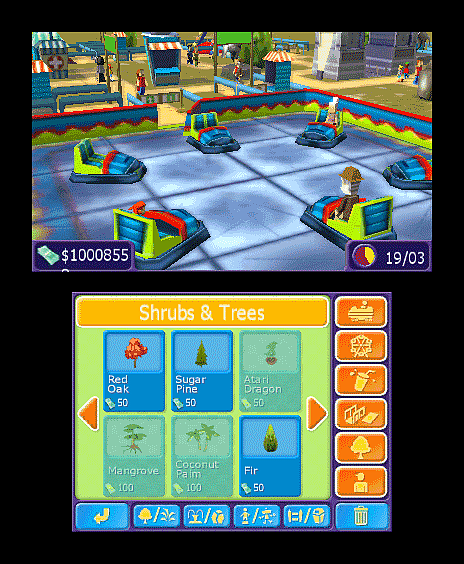 As you progress, you’ll unlock tons of unique attractions, themes, amenities and more! Go on a ride in 3D! 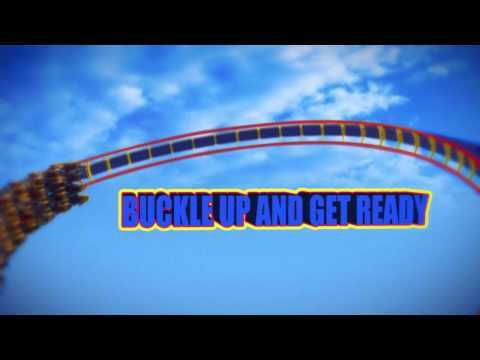 : the first-person view for coaster rides fully immerses players with the innovative 3D display. First-person track builder: the first-person track builder is an entirely streamline and intuitive way to build coasters. It not only allows players to experience the building process from a brand new perspective, but also makes coaster creation highly accessible by letting players easily switch between first- and third-person view. 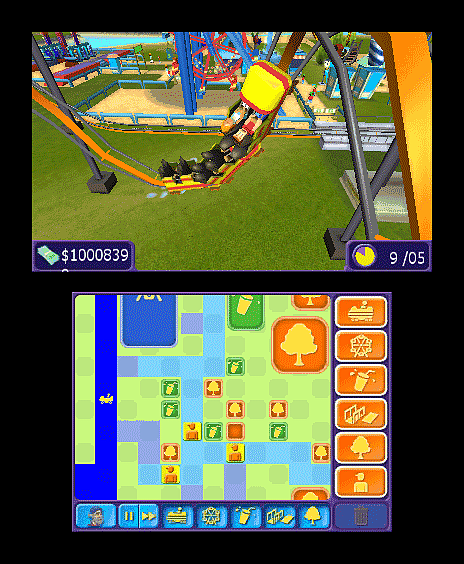 Track auto-complete: RCT 3DS is made completely accessible with the addition of the auto-complete function, where players can effortlessly complete a full roller coaster circuit with a simple tap of the stylus. 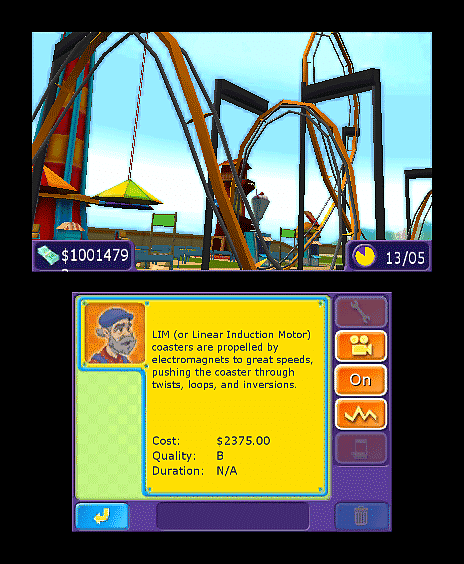 Mii Character implementation: Your friends can enter your theme park as a guest and enjoy roller coaster rides and other park amenities! Hire friends to patrol your theme park and perform specific duties! Unlock special attractions and themes with StreetPass! Share your favorite roller coaster designs with ease! 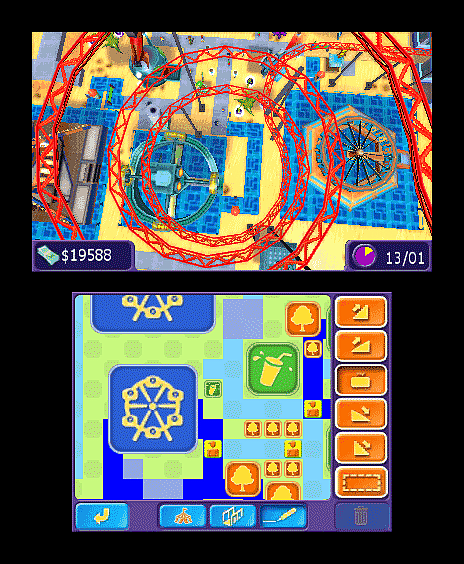 Sharing your coasters and theme parks is a big part of the RollerCoaster Tycoon experience and the 3DS version will not only continue this trend, but make it much easier for players everywhere to exchange content!